I had terrible lower-back pain for most of 2006 and 2007. I blamed sleeping wrong and lifting heavy things sometimes, but most of the time, I just assumed that this was normal. One August morning, the pain was so bad that I could barely get out of bed. More alarmingly, the pain had spread down my left leg, and my left foot felt half-asleep. It was time to see a doctor. 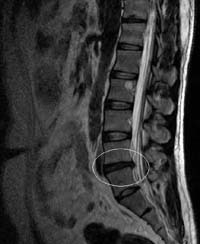 Someone else’s herniated disc. Mine’s worse and the little black blob sticks out further. They wouldn’t give me pictures of mine unless I filled out 1.65 billion forms, none of which were available except during all of the hours I couldn’t be there. I was driving on a lot of long car trips. I was sitting all day. I would go from bed to train to office to train to computer to couch to bed, sitting nearly the entire time, every day. When sitting, I would slouch most of the time. I was completely out of shape and got no regular exercise. I now use a standing desk. I can sit occasionally throughout the day, but I need to minimize it and avoid sitting for long periods of time. When I sit, I have to practice good posture. I joined a gym and need to exercise and stretch in specific ways on a regular basis, as I learned in physical therapy, indefinitely. I got a very nice new mattress. I have to avoid traveling on long car or plane trips. I got used to the standing desk after a few weeks. I don’t even notice it anymore. It’s easier to take coffee breaks because I’m already up — I just need to start walking. I burn more calories and strengthen my legs all day instead of sitting and getting fatter. No complaints on this one. Sitting with good posture? Being forced to exercise regularly? Sure, being lazy is easier, but there’s no question that this is better for me, and I certainly would never have fixed either of these without this motivation. New mattress? Sure, I had to spend money for it, but I should have done that long ago anyway. I had been using a free hand-me-down that sagged tremendously. While this didn’t cause my problem, it certainly wasn’t helping. The only real problem is the travel restriction, but I’ve driven more than anyone should in the last few years. My car is 2 years old and has 32,000 miles. I put 45,000 miles on my previous car over 3 years. I’m taking a well-deserved break. Looking at the changes I’ve had to make, is this really a problem?